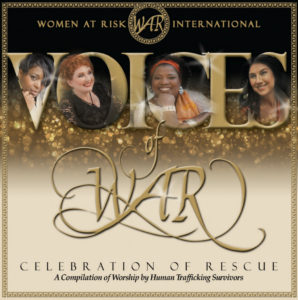 Women At Risk, International is excited to announce the recent release of our first CD project, Voices of WAR. You won’t want to miss this stirring compilation of worship songs sung by four talented survivors near and dear to the heart of WAR. Standing in the shelter of the WAR boutique, they sang—binding their hearts. Staff and shoppers held their breath as they witnessed the unique “circle of protection” that exists between survivors: a powerful, invisible bond, an instant connection. The trauma scars that once held their bodies and hearts captive evaporated as these survivors found safety and refuge in each other’s presence. They held each other’s hearts tenderly, without judgement, with eyes too old for their souls, having walked the same path. That day, the dream of recording their voices was born. Several years later, these talented vocalists, along with another talented survivor, gathered in Nashville, Tennessee, to make that dream come true. (The fourth singer recorded her songs separately.) Joined by a world-class producer and musicians, they assembled in Reba McEntire’s studio and poured out their hearts in song and celebration of the journey to healing. I’m sitting in Reba’s studio. It doesn’t look like a studio. Oh, yes, there are buttons everywhere that the sound engineers are magically controlling. But it looks like my home. This makes me happy. My survivors will feel like we are hanging out in a cozy safe place. This is good. I feel at home. I look at the women gathered here for this precious day. Oh, Evil, when you picked on these girls, you picked the wrong crowd. They have been to hell and back. But you cannot keep them down. … I look at the pain on their faces as they sing and I determine—so help me God—to buy it back, one tear, one song at a time. May their tears of joy turn those listening away from sorrow and into a new circle of protection and hope! I want every listener to feel God’s presence like light seeping into their darkness. We invite you to be one of those listeners, allowing the joyful voices of these gifted women fill you with God’s presence as you join them in a celebration of rescue and hope. From the rousing strains of “Break Every Chain” to the quiet strength of “In You,” from the fiery declaration of “Giving Back Love” to the worshipful tones of “The One,” Voices of WAR will inspire you, delight you, and draw you into a worship experience like no other.